Striking 8mm Peacock Cultured Pearls set on silver (925) hallmarked posts and butterflies. The Cultured Pearls have very good lustre and are ideal for Fashion, Birthdays, Informal/Formal, Valentines, Weddings and Anniversaries. These earrings are classic and are suitable for all ages. 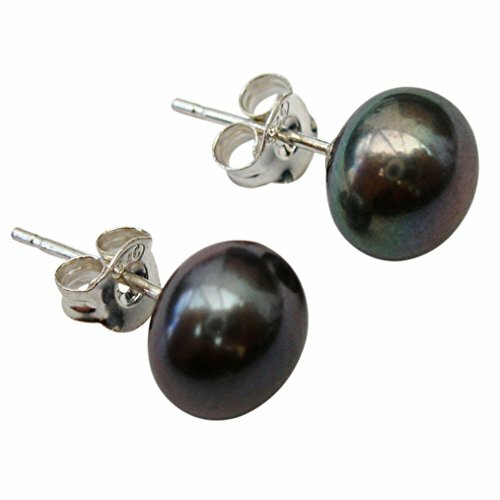 Black Cultured Pearls are rarely jet black but have blue, green, grey, aubergine, peacock and more overtones. The earrings come in a pretty pouch with a gift card and care of your Cultured Pearls guide. All our Cultured Pearl jewellery features genuine Cultured Pearls which are carefully selected by us.